Sumo is a competitive full-contact wrestling sport where a wrestler (rikishi) attempts to force another wrestler out of a circular ring (dohyo) or to touch the ground with anything other than the soles of the feet. Originating from Japan with centuries of history it has remained mostly unchanged. Including the ritualistic aspect of this martial arts, where it is used in purification rituals of the Shinto religion. There are six grand tournaments in which men can test their strengths. Three of which are held at the Sumo Hall in Ryōgoku (Image). As you will by now notice this new series centres around this unusual martial arts. The story follows a high school freshman as he faces challenges from delinquents to rivals as he pursues his goal of becoming the greatest sumo wrestler in the world. 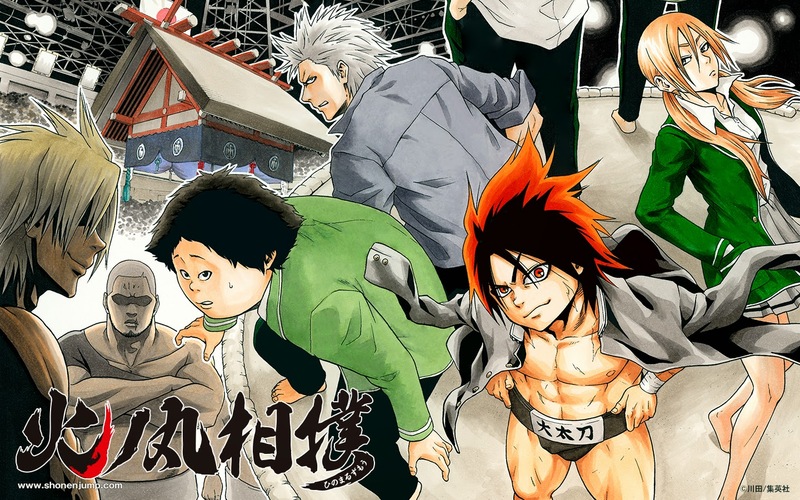 Hinomaru Zumou first appeared as oneshots in 2013 magazine editions of Weekly Shonen Jump and Jump Next!. It was officially serialised in Weekly Shonen Jump issue 26. There is no major differences between the oneshot and series. It is important to not at this point that Kawada recieved an honourable mention with 'Love and Justice' in the 2009 Tezuka Award. "Holy Mawashi!" was the only thing that could be said after reading the first chapter. It was so unexpected and fun to read from start to finish. The beginning of the chapter introduced our heroes and explains the huge problem that they first faced with as members of the schools sumo club. As the story progresses it goes through some background story and history which is uncharacteristic with a first chapter. However it becomes clear that it is important information relevant to the chapter. When the battle starts you are blow away by the dynamic scenes and the brutal retaliation of the sumo club. The first chapter could not have been better and I expect high ranks for it. I will follow this series with much interest and hope that the series will appeal to the all important Japanese readers.